I went with Dan and Steve.... they drove down on Wednesday, stopped over at Kate and Jason's, and then drove the rest of the way to Atlanta on Thursday. I flew down on Thursday. It was absolutely pouring buckets when I got to the hotel. I relaxed in my room before the guys arrived. We went to the main hotel for the Con and picked up our name badges. No badge, no entry into a lot of the events, or even the hotel where they were held. That night we went to Hooters for dinner, which was enjoyable for me... I had never been. The wings were excellent, and I enjoyed watching the girls there with their boyfriends, clinging to them extra tightly. Dan and Steve and I split two pitchers of beer, so I got to drunk dial Jason that night. There are really three main types of people who go to Cons, 1) Geeks like me who want to play roleplaying games with some of the best players in the country. 2) People who are fanatical about one show or genre (for example, Star Wars) and attend pannels and group activities for that genre the entire time. 3) People who want to see and be seen in some crazy costumes. Also goes well with number two. I saw many people running around with not a lot of clothing. If I had a kid, I wouldn't bring them around after 8. Dan, Steve and I registered for the roleplaying games we were playing in weeks before the convention started. We all played in the same game Friday morning at nine. They gathered us all in one room, and and they had us meet the guys running our games, and then we split off by the games we were playing. The first game we played in was a superheroes game called "You Awaken in Darkness" We were new superheroes trapped in this lab. It was a lot of fun. After each game, the person running the game got to choose the best player. Steve was voted the best player, and it turns out the guy who ran our game wrote a book. So Steve got a copy of it. I am going to borrow it after Dan is done. He was an excellent storyteller. The guys had games right after the one we played in, so I went back to the hotel, ate my leftover wings, took a swim, had a nap, and got a shower. 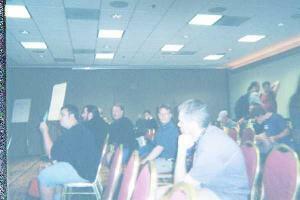 At six, I went back to the hotel where the roleplaying games were, and played in an Amber game. Amber is a game based on a series of books. The basic idea is you have these godlike people who created little universes (including Earth) for their own amusement. We played people who were children of the people from Amber, and had no idea. I played a little pixie. It was a blast. We played from six to midnight. The guy running the game decided I was the best player. I ended up with a voucher, which you turned in for a coin. It was worth $5 at the stores at the convention, or the art show. I decided to keep mine, because they said it could be spent at next year's convention. Sounds like fun. I never did get into role-playing games. I always thought it would be interesting, but we weren't allowed to do that kind of thing, since it's evil. I went to Christian school, you see. I remember playing D&D once in Grade 7. It was me and a couple others...we couldn't go swimming with the rest of the class for whatever reasons (I had a cold), so we were killing time in the observation room. We had to play really quietly so the teacher wouldn't know we were playing. I thought the Amber game was like where a child gets kidnapped and an Amber Alert goes out. No?